Construction on a “high quality” segregated two-way cycle route on Dublin’s quays could start next year. The cycle route is planned to link The Point in the east with Heuston Station and the Phoenix Park in the west. After ‘key stakeholder’ consultation last week, the head of one of the city’s business groups called the latest outline designs “a well structured plan that will work for all”. The plan is set to go out to full public consultation later this year, but the project will likely mainly depend on the approval of Dublin City councillors. While some suburban councillors may be resistant to the plans, the expansion of DublinBikes around Heuston will add to the focus on the need to make the quays safer for cyclists. Our survey last year found that 66% of Dublin politicians support changing quays for a cycle route. The city council has yet to present the preferred option publicly, however this website understands the outline design presented to key stakeholders includes a quay-side cycle route on the north quays and new boardwalks to accommodate pedestrians at pinch points. Earlier suggestions to move cars off the north quays and have two-way traffic on the south quays have been dropped. Outline ideas to change traffic flows were not deem to be workable, instead pedestrian-only boardwalks will be used at pinch points on the north quays, such day at Arran Quay and Ellis Quay. 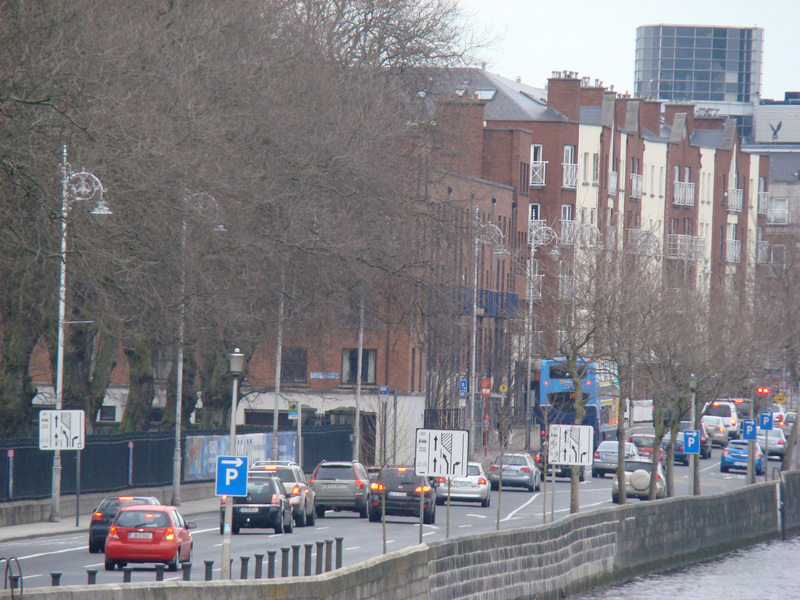 A bus lane and at least one traffic lane will be retained along the north quays. It’s estimated that over 550 cars which use the quays as a through route will be taken off the quays in the morning peak. Issues involving cyclists reaching the route from the south quays are expected to be planned for in the design process. Dublin City Council, the National Transport Authority (NTA), and their consultants AECOM and Roughan O’Donovan, looked at 13 possible route options. For key stakeholder consultation, this was filtered down to five workable options and then a preferred option emerged from this. Compared to the five short-list options, the one chosen has the least impact on public transport and traffic. It has a mixed impact on pedestrians — this, it seems, depends on the final design. Any project — to comply with the Manual for Urban Roads and Streets — will have to include additional pedestrians crossings on junctions which currently lack crossings on all four arms. The key stakeholders included business groups, transport operators, and sections of the city council who had not been involved until this stage. In recent weeks €150,000 of NTA was approved for preliminary design and part 8 planning of the route. The plan is in keeping with the Dublin City Development and the City Centre Public Realm Strategy – both of which were approved by councillors. The current Dublin City Development plan says it is an objective of Dublin City Council to “provide a continuous cycleway connecting the Phoenix Park and Heuston Station to the proposed S2S route along the city’s quays” within the lifetime of the development plan, which runs up to 2017. The project has the potential to be a key link between a large number of planned greenways in Dublin City — including the Liffey Greenway; the River Camac Greenway; the Grand Canal Greenway; the Royal Canal Greenway; Dodder Greenway and the Dublin Bay coastal route. The coastal route which was first known as the Sutton to Sandycove (S2S) route, but under the draft Greater Dublin Area Cycle Network plan, it’s now named the ‘East Coast trail’ and stretches from Arklow to Drogheda. It is great that they are actually going to put it in place but I would love it if they removed Motorised Traffic from the Nth Quays altogether . It would give a bit of breathing space to Pedestrians and Cyclist alike. They still cant resist giving in to Motorists by allowing Traffic on the Quays. Dublin Cycling advocacy groups were also a ‘key’ stakeholder. The progress of this project will be a key indication of the advances made by Dublin City in rebuilding the city as a ‘Living City’. It is a major statement!